Even though you were almost 11 years old when you came to us, you taught us some wonderful lessons. We learned that senior dogs were the best. 11 Greyhound years meant that you could still counter surf… Phoebe always knew when we forgot to put away something on the counter and she would find it. I had no idea how hard heavy whipping cream was to clean up off of the floor. 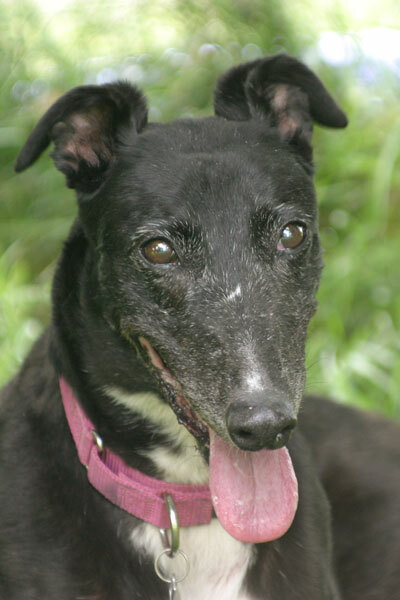 11 Greyhound years meant she had refined the art of chewing… Phoebe aquired a taste for small electronics almost immediately. The Ipod still worked, even with teeth marks in the metal back and cracks in the plastic. The PDA didn’t have a fancy case anymore. And the down blanket had millions and millions of tiny feathers. 3 years later a feather or two still floats through our atmosphere. 11 Greyhound years earned respect from all of the other hounds… Lights-out meant it was time to be quiet and Phoebe would give one low growl and a bark and all of the youngsters would quiet. 11 Greyhound years meant you could still run with the best… It was a little frightening, because even though she ran like she was 3 or 4 again, I knew she didn’t quite see like the 3 and 4 year olds. 13 Greyhound years taught us great lessons in patience. A small scrape on her ankle became a daily bandaging job because once it was healed, she promptly chewed it open again. For more than a year we wrapped her ankle in bright bandages. Phoebe came to us with a huge overbite, a sway back and a dull coat. Karen’s first words were wow, she really is a needlenose. Phoebe taught us that there will always be room for a senior Greyhound in our house. Phoebe, you will always be the Grand ol’ Dame of the Gardens. We will miss you more than you can imagine.